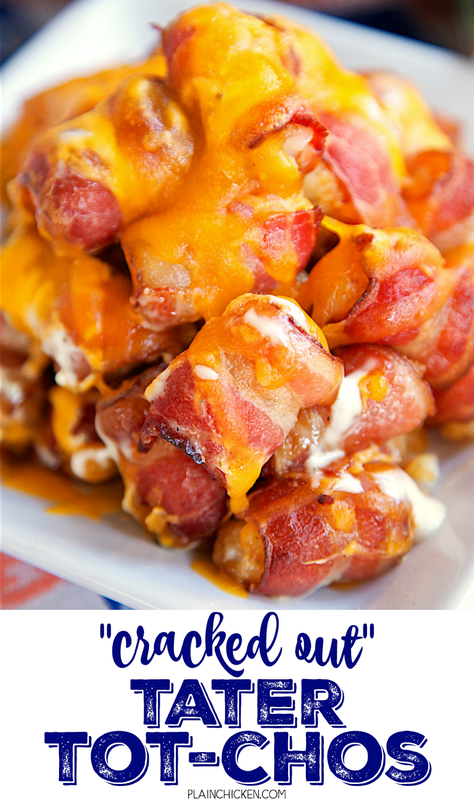 "Cracked Out" Tater Tot-Chos - Bacon wrapped tater tots topped with Ranch dressing and cheddar cheese. Only 4 ingredients and ready in about 30 minutes. OMG! This might be the best thing I've ever eaten! Seriously! These are gone in a flash! I never take home any leftovers. Tomorrow is A-Day at Auburn University and Alabama has their spring game next weekend. I can't wait for a little taste of college football!! I also can't wait to see all of our football friends and tailgate. As you probably know, I am all about the tailgate food. I am bringing these "Cracked Out" Tater Tot-chos for the game. 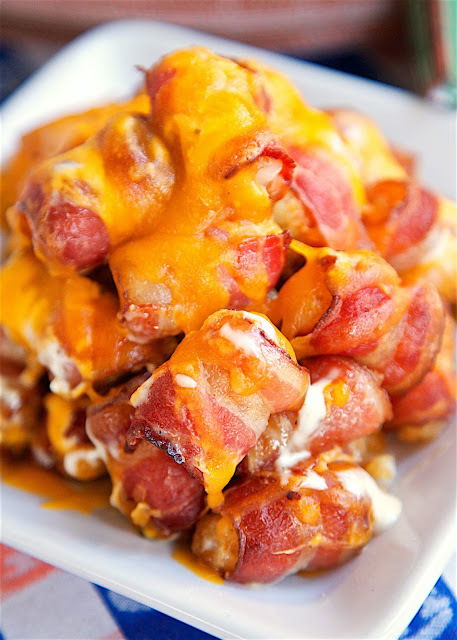 Bacon wrapped tater tots topped with Ranch dressing and cheddar cheese. OMG! This might be the best thing I've ever eaten! Seriously! I made this last week and ended up eating them for lunch. I was only going to sample one or two, but I couldn't stop eating them so I just made them lunch. SO good! I can't wait to share these with our tailgate group. 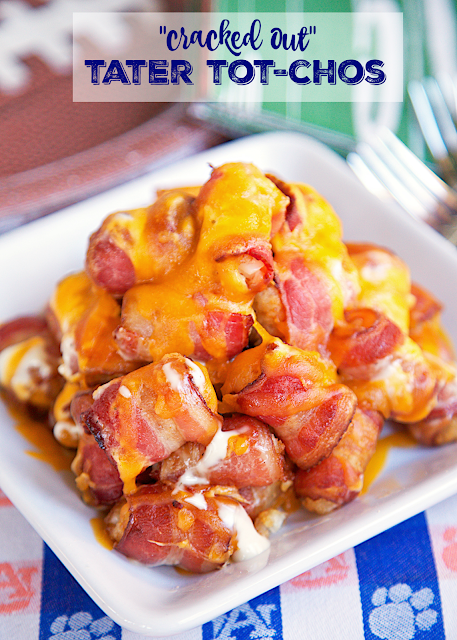 I will bake the bacon wrapped tater tots before the game and then top them with the bacon and cheddar in the parking lot. I have a kitchen torch to melt the cheese. The torch will also help warm up the tots. If you don't tailgate, no worries! These also make a great party appetizer. I promise people will go crazy over them!! Preheat oven to 400ºF. Line a baking sheet with foil and set a baking rack inside. Set aside. Cut each strip of bacon into thirds. Wrap tater tots in bacon and set on baking rack. Place cooked tater tots on platter or in a 9x13-inch pan. Drizzle with Ranch dressing and top with shredded cheese. Return to oven for 5 minutes, until cheese has melted. I bet these would be good with sour cream and chives or green onions instead of the ranch.